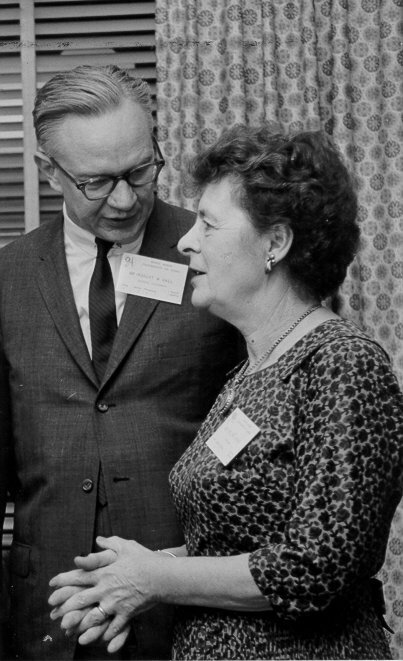 Eveline Burns was an economist and educator, teaching economics and social work at Columbia University for nearly 40 years. She was a member of the technical staff of the Committee on Economic Security (CES) in 1934, working on the Employment Opportunities group and she authored three major research papers on employment security issues for the CES. This experience with the CES led to Dr. Burns developing a career-long interest in Social Security and she became one of the leading academic experts on the subject. She authored three important books on Social Security and was the first training consultant to the Social Security Board in early 1936. 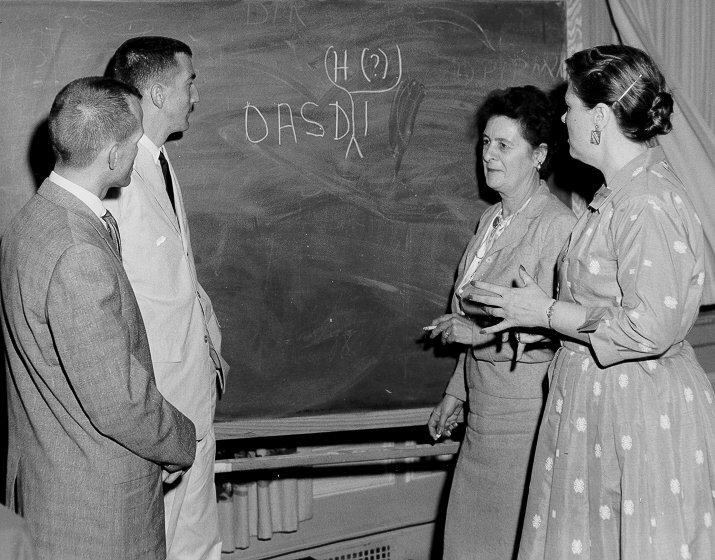 She frequently met with SSA executives and staff to conduct training and continue her teaching mission. Professor Burns with the Deputy Director of SSA's Bureau of Old-Age and Survivors Insurance, Robert Ball. The occassion was the White House Conference on Aging in January 1961. Dr. Eveline Burns discusses the Social Security program with SSA Claims Examiners (l. to r. Bob Hostetler and Darrell Crane, Kansas City Processing Center and Marjory Hardy (far right) of the Chicago Processing Center. June 1960.